What is GBS Big Search? 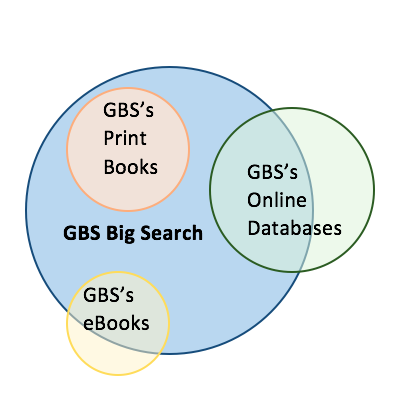 Q: What is GBS Big Search? A: GBS Big Search is the GBS Library's new discovery tool that allows you to search many of the library's collections for books, reference articles, magazine and newspaper articles, scholarly articles, eBooks, the GBS LibGuides, and more. Q: What does the GBS Big Search actually search. Are all the GBS Databases in the GBS Big Search? A: Most of the GBS Library's collections are included, but not all. It exclusively searches our library resources, not the free internet. For more information on what's available and what isn't, click here. Q: How can I tell whether a specific magazine, newspaper, or journal is in GBS Big Search? A: Go to the GBS Big Search advanced search page, enter the periodical name in a search box. Next, change All Fields to Publication Title and click Search. Q: Is GBS Big Search the best place to do all of my research? A: If you're searching for many topics in health, science, history, social studies, and many Pro/Con Social issues, you will get more targeted results in the subject databases. Use the LibGuides A-Z Database list to find the best databases for your subject research. Q: Is there a more detailed guide to using GBS Big Search? A: Yes. For more detailed information about GBS Big Search and its functions click here or you can watch our video introduction to the GBS Big Search here. Have questions about searching in GBS Big Search? Chat with a librarian during school hours. Use our Ask A Librarian form anytime. We will get back to you as soon as we can. Having technical problems with GBS Big Search? Use quotation marks when you want to search for a phrase: "space race", "high school", "civil liberties"
Use an asterisk (*) [shift+ 8 on your keyboard] at the end of a root word to get variations on the term: smok* will retrieve smoke, smokers, smoking, etc.